Grid supports arranging views into rows and columns. Rows and columns can be set to have proportional sizes or absolute sizes. The Grid layout should not be confused with traditional tables and is not intended to present tabular data. Grid does not have the concept of row, column or cell formatting. Unlike HTML tables, Grid is purely intended for laying out content. Purpose – common uses for Grid. Usage – how to use Grid to achieve your desired design. Rows and Columns – specify rows and columns for the Grid. Placing Views – add views to the grid at specific rows and columns. Spacing – configure the spaces between rows and columns. Spans – configure elements to span across multiple rows or columns. Unlike traditional tables, Grid does not infer the number and sizes of rows and columns from the content. Instead, Grid has RowDefinitions and ColumnDefinitions collections. These hold definitions of how many rows and columns will be laid out. Views are added to Grid with specified row and column indices, which identify which row and column a view should be placed in. Auto – automatically sizes to fit content in the row or column. Specified as GridUnitType.Auto in C# or as Auto in XAML. Proportional(*) – sizes columns and rows as a proportion of the remaining space. Specified as a value and GridUnitType.Star in C# and as #* in XAML, with # being your desired value. Specifying one row/column with * will cause it to fill the available space. Absolute – sizes columns and rows with specific, fixed height and width values. Specified as a value and GridUnitType.Absolute in C# and as # in XAML, with # being your desired value. 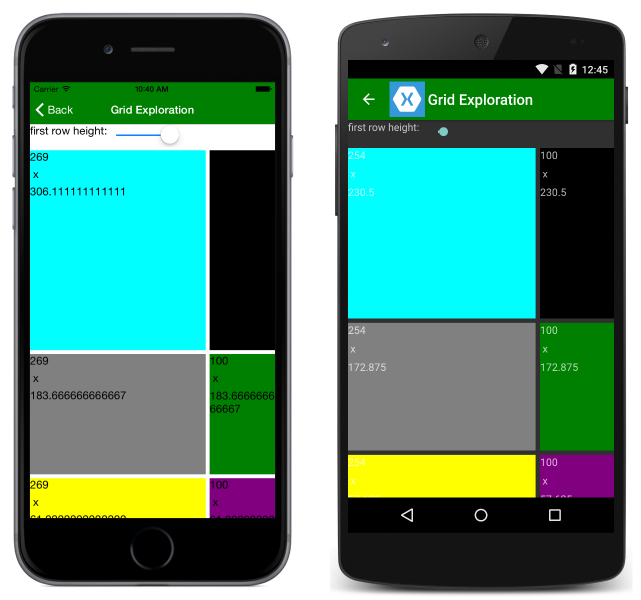 The width values for columns are set as * by default in Xamarin.Forms, which ensures that the column will fill the available space. The height values for rows are also set as * by default. Consider an app that needs three rows and two columns. The bottom row needs to be exactly 200px tall and the top row needs to be twice as tall as the middle row. The left column needs to be wide enough to fit the content and the right column needs to fill the remaining space. To place views in a Grid you'll need to add them as children to the grid, then specify which row and column they belong in. 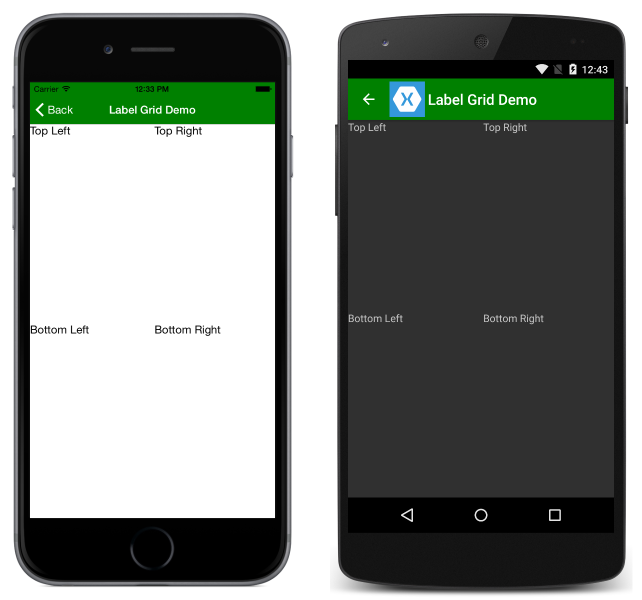 In XAML, use Grid.Row and Grid.Column on each individual view to specify placement. Note that Grid.Row and Grid.Column specify location based on the zero-based lists of rows and columns. This means that in a 4x4 grid, the top left cell is (0,0) and the bottom right cell is (3,3). The above code creates grid with four labels, two columns, and two rows. Note that each label will have the same size and that the rows will expand to use all available space. ColumnSpacing – the amount of space between columns. The default value of this property is 6. RowSpacing – the amount of space between rows. The default value of this property is 6. Note that in code, static methods of the Grid class are used to perform positioning changes including changes to ColumnSpan and RowSpan. Also note that, unlike other properties that can be set at any time, properties set using the static methods must already be in the grid before they are changed. 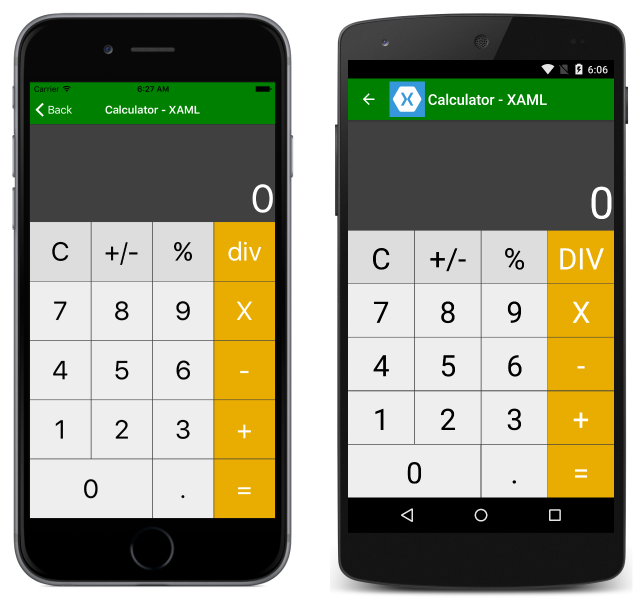 Title = "Calculator - XAML"
<Label Text="0" Grid.Row="0" HorizontalTextAlignment="End" VerticalTextAlignment="End" TextColor="White"
<Button Text = "C" Grid.Row="1" Grid.Column="0"
<Button Text = "+/-" Grid.Row="1" Grid.Column="1"
<Button Text = "%" Grid.Row="1" Grid.Column="2"
<Button Text = "div" Grid.Row="1" Grid.Column="3"
<Button Text = "7" Grid.Row="2" Grid.Column="0"
<Button Text = "8" Grid.Row="2" Grid.Column="1"
<Button Text = "9" Grid.Row="2" Grid.Column="2"
<Button Text = "X" Grid.Row="2" Grid.Column="3"
<Button Text = "4" Grid.Row="3" Grid.Column="0"
<Button Text = "5" Grid.Row="3" Grid.Column="1"
<Button Text = "6" Grid.Row="3" Grid.Column="2"
<Button Text = "-" Grid.Row="3" Grid.Column="3"
<Button Text = "1" Grid.Row="4" Grid.Column="0"
<Button Text = "2" Grid.Row="4" Grid.Column="1"
<Button Text = "3" Grid.Row="4" Grid.Column="2"
<Button Text = "+" Grid.Row="4" Grid.Column="3"
<Button Text = "0" Grid.ColumnSpan="2"
<Button Text = "." Grid.Row="5" Grid.Column="2"
<Button Text = "=" Grid.Row="5" Grid.Column="3"
Notice that both the label at the top of the grid and the zero button are occuping more than one column. Although a similar layout could be achieved using nested grids, the ColumnSpan & RowSpan approach is simpler.